Gave $50,000 to Heritage School for the 2015/2016 Strategic grant PROJECT LAUNCH which incorporates the 4Cs – collaboration, communication, creativity and critical thinking – into the entire curriculum. Pledged $75,000 for the 2016/2017 Strategic Grant, The Hornet Hub, an innovative learning space located in the High School. 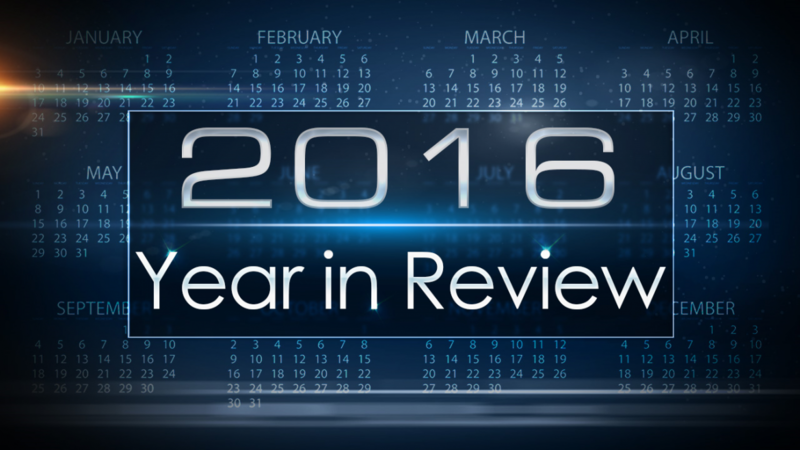 Provided over $30,000 in teaching grants for the 2016/2017 year. 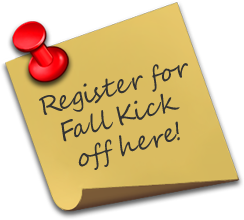 The annual Fall Kickoff took place on September 27th, at Saline High School. Attendees heard from our guest speaker, Rich Sheridan, CEO of Menlo Innovations and author of Joy, Inc. Other speakers included Lucas Foster (Teacher/Mapdemoneum Grant), Chris Myers (Hornet Parent/Corporate Sponsor), and Jen Denzin (Teacher/Capstone Class) expressing their gratitude for teaching grants, funded by the Foundation for Saline Area Schools, that have impacted their lives in a very positive way. Briarwood Ford, presenting sponsor for Kickoff, awarded the Foundation a check of matching funds up to $5,000 for the 2016-2017 Strategic Grant, the Hornet Hub. Students and administrators took the attendees on tours through the Hornet Hub and demonstrated how they used this new, innovative learning space that incorporates the four C’s – collaboration, communication, creativity and critical thinking! 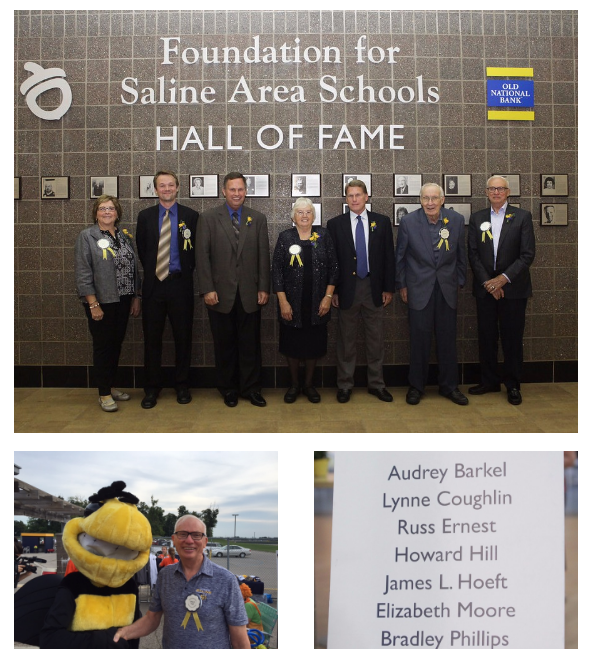 We honored our 3rd Hall of Fame class beginning with a party on the patio at Hornet Stadium, on Friday, during the football game, and a banquet on Saturday night. The class of 2016 included Audrey Barkel, Lynne Coughlin, Russ Ernest, Howard Hill, James L. Hoeft, Elizabeth Moore and Bradley Phillips.Patio sponsor was Keller Williams – Lisa Dempsey & Nancy Chenevey, Banquet sponsor was Great Lakes Educational Group and Wall of Fame sponsor was Old National Bank.To nominate for the 4th Hall of Fame class, click below. 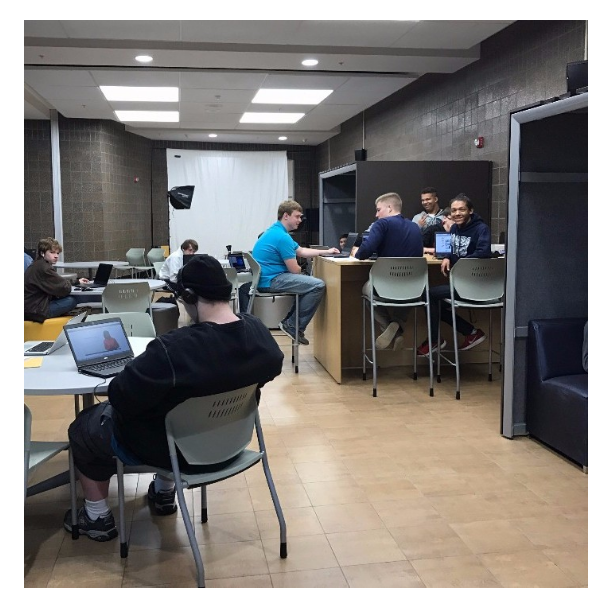 The 2016-2017 Strategic grant is the Hornet Hub, an innovative 21st century learning space, located in Saline High School. The Hornet Hub will engage our students in meaningful projects promoting and incorporating the curricular components of the 4C’s – collaboration, communication, creativity and critical thinking. 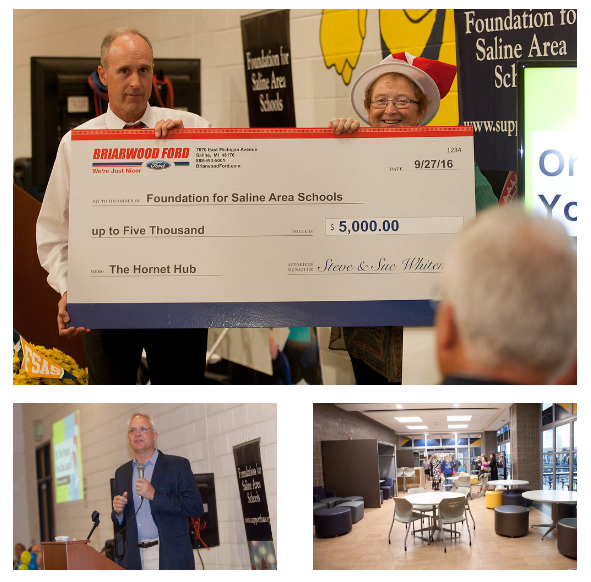 The Foundation for Saline Area Schools provides teaching grants designed to get resources quickly into classrooms to support innovative ideas and projects. When you think of your elementary gym class, what you do remember? We bet it doesn’t involve a 55” Smart TV, Fitbit Activity Trackers, Go-Pro technology and iPads involved in daily instruction! Welcome to gym in the 21st century with Joe Welton at Pleasant Ridge! Next Gen Gym is an ideology that leverages advanced technology to more fully develop students’ skills in PE class. This technology allows students to visualize and highlight correct performance through the use of basic video features. Joe Welton developed the idea of Next Gen Gym through research and knowledge of coaching apps such as Hudl Technique and Go-Pro technology. After receiving a grant from the Foundation, Joe began to implement this high tech concept into his elementary physical education classes. Hudl Technique allows users to review reps in 240 frames per second, giving educators the ability to analyze and correct a student’s performance in real time. It also allows the instructors to comment with notes and voiceovers before sending it back to the students through the app. Hudl Technique is really special because it allows students to receive live, first-person feedback to break down performance and assist students in correcting deficits during class. 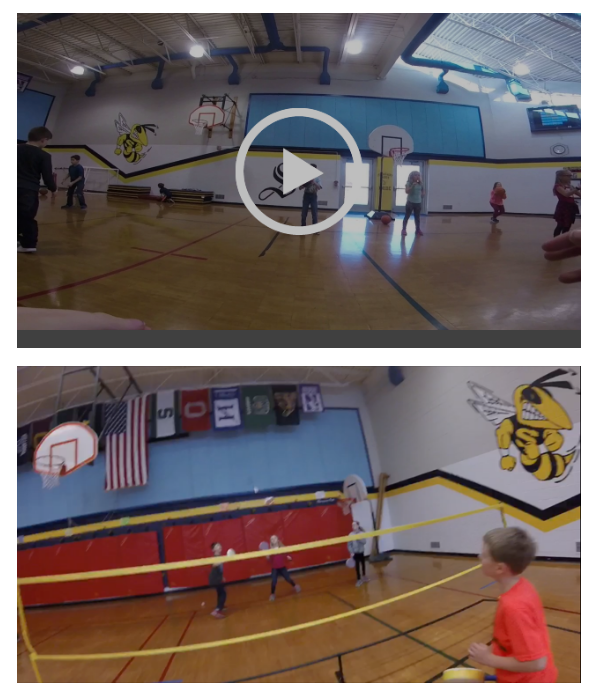 Go-Pro technology allows the students to see the use of hand-eye coordination come into play in the gym. The Go-Pro camera helps create a unique and fun learning environment for all students through video footage. “Our students have really responded to this and love having the Go-Pro on their head at all times. 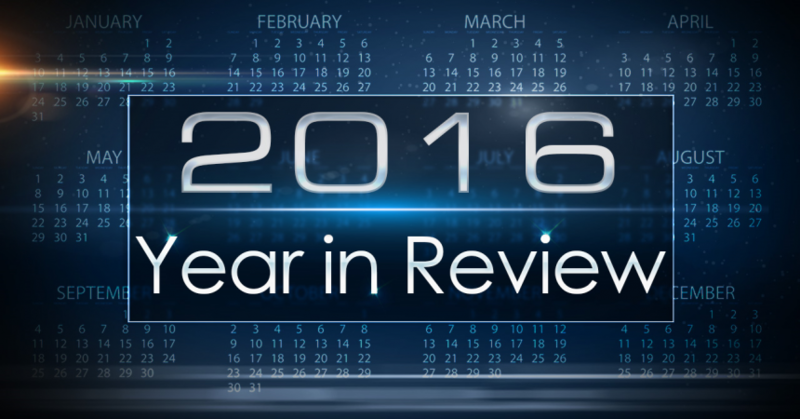 It has been a phenomenal teaching tool for me in the gym”, says Welton. This is what we are “hearing” is happening at Heritage! Forbrain is a tool that alters the way students hear their own voices by using bone conduction and a dynamic filter. Lin Nichols, speech-language pathologist at Heritage School, received a grant from the Foundation for this very unique learning device. Lin applied for this grant due to the need of students who had difficulty self-monitoring and maintaining attention in the classroom. Forbrain is used for a wide group of students, including those on the autism spectrum, as well as those with articulation and language impairments. When Lin was asked about how she discovered Forbrain, she responded that she is always on the lookout, through professional sites and professional learning communities, for innovative resources that assist students in improving their communication skills. Several of these students who use Forbrain have received other aids but this device has produced the most dramatic results. It is especially helpful for students who struggle with specific sounds such as “r” and “s” in words like “harvest” and “star”. 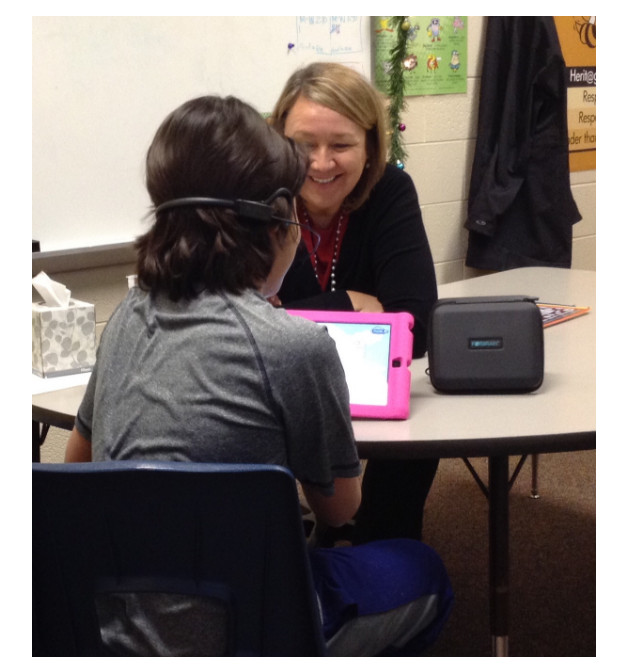 Students love hearing their own voices and frequently ask for the Forbrain device. Similar to a headset worn by many famous singers, Lin says that the kids feel like rock stars when they wear it. When the headset is put on, students are able to hear their voices emphasized by the pulsating and vibrations it produces, through their zygomatic bones, or cheekbones, directly in front of their ears. Congratulations Lin on this wonderful tool that is helping many of our students become better communicators for the 21st century! As you may be aware, honeybees all over the world are experiencing “Colony Collapse Disorder” and their populations are diminishing each year. Gerry Harrison, Fifth Grade Teacher at Heritage School, is aware of the diminishing bee population and its effects on the environment. He received a grant last year from the Foundation in order to establish beehives outside of his classroom and to begin a beekeeping project aimed at helping honeybee populations and educating students on the importance of bees in our world. Students are involved in researching, building, and installing a beehive. Gerry is working with local beekeepers, including two of his colleagues, Lin Nichols and Heather Schaare, while implementing his project. 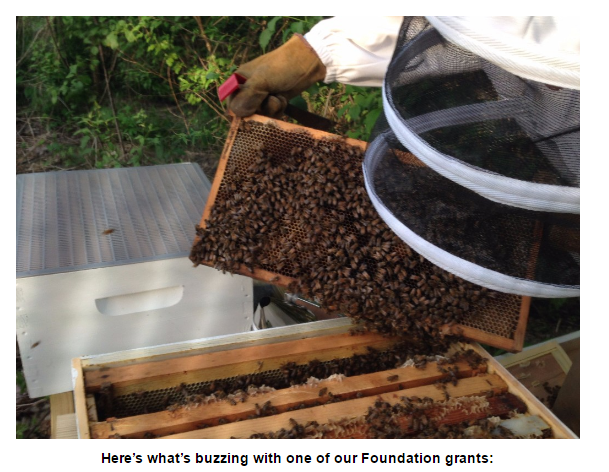 It has been less than a year since the beehive has been installed and is already buzzing with results and excitement. Gerry estimates that approximately 50,000 bees have called it their home, and he has already harvested several jars of honey. He is helping students discover the many aspects of beekeeping including: biology, agriculture, ecology, environmental studies, culinary and nutritional studies and business. In doing this, students are able to identify a honey bee from other types of bees and are developing a respect for the honeybees’ role in the environment. Students may be able to provide hands-on, year round experience if they are interested in beekeeping, or may even discover some of Gerry’s bees in their own backyards as these bees generally pollinate up to 5 miles from their hive. As Gerry and his project take a lead in addressing a critical environmental concern, we expect that others in the community may take an interest in it as well. As students share their knowledge about the intricate details of beekeeping and just how fascinating a bee’s world is, one can’t help but want to get involved. Some may establish their own beehives at home, while others may focus on reducing pesticides and herbicides, incorporating bee-friendly plants into their landscape, or supporting local harvesters by purchasing local honey. Gerry attributes his success of this project to those who helped him get this project underway, including Lin Nichols, Heather Schaare, Linda Smith, Kevin McCowan, and Amy Randall and is grateful to the Foundation for the initial grant.